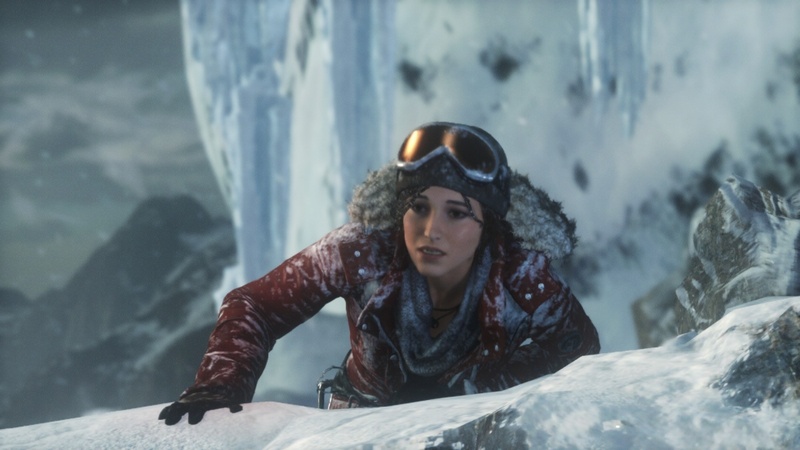 It would be easy to open with blasting Square Enix once again for the ridiculous decision to make Rise of the Tomb Raider a timed Xbox exclusive and forcing PlayStation fans that have helped solidify Lara Croft and her series' status as one of the most iconic in the industry to wait an entire year before getting their hands on it… but we won't. Following the PC release, the second chapter in the reimagining of the most famous archaeologist and treasure hunter in video games has at last made its way onto PlayStation 4 in Rise of the Tomb Raider: 20 Year Celebration, an edition that crams all previous add-on content and more into one meaty package. Looking surprisingly scar-free after her trying ordeal to survive the traumatic events on the island of Yamatai in Tomb Raider, and the greatest she ever has done with an updated face that better resembles her voice and motion capture artist, Camilla Luddington, Lara Croft is growing into the boots of the character fans have known for seeking out the world's most ancient hidden, dark and dangerous artefacts in the video game world. It is naturally going to take time and more than a couple of games to build this refreshed Lara into the woman we all expect, but Rise of the Tomb Raider is an indicator that things are progressing steadily in the right direction—and that goes for the series reboot as a whole, too. Lara is continuing her late father's research on finding the key to immortality—the Divine Source buried somewhere in Siberia. Her eagerness and obsession visibly has an effect on those close to her, as well as herself, as a determined young woman cares not about what others think and will stop at nothing in pursuing her goal. This quest holds deeper personal meaning because of the family connection, but having now had first-hand experience of the supernatural existing in the world—and battling through a near-death experience against all odds—this is a Lara that knows there are more unexplained secrets out there, intends to find them, and will be able to handle anything that stands in her way. Despite echoing Uncharted 2 in the sense it begins in medias res in a snowy region, and quickly progresses into Lara getting battered, blown up and surviving unreal odds à la Nathan Drake, Rise of the Tomb Raider really sets itself apart from Naughty Dog's series by not relying so heavily on the set pieces, and offers a greater degree of freedom, sense of adventure and realism. In fact, it is pleasing to say that this feels much more like the Tomb Raider of old, even if there is still work to do. Plenty of areas Lara comes across allow for exploration in a sort of semi-open world, with cracks in walls and blocked off passageways leading to caves, crypts and ruins that evoke the sights expected of original games in the series. 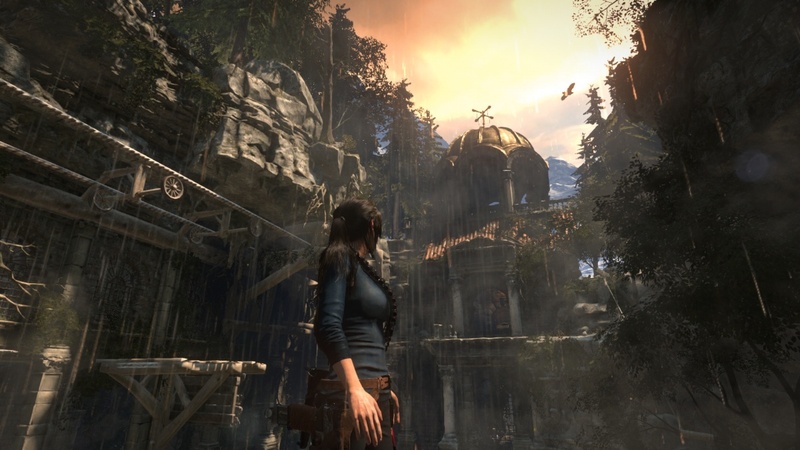 There are some strong level designs that require a mix of puzzling and platforming, with some needing a good chunk of time to figure out to reach the treasure at the end, which is usually a new ability to enhance Lara's adventuring, combat or survival techniques. Exploration is encouraged and rewarded, and the abandoned ruins make sense in the world narrative—they aren't shoved in there just to appease the complainers about "lack of tombs" (although it never hurt to complain about that, anyway, just to drive the point home and ensure more tomb raiding was added in this sequel). It is these elements that combine to put the "Tomb Raider" into "Rise of the Tomb Raider," but although there are indeed portions on the main story path that place Lara into other, similar ruined areas, there still isn't enough to satisfy the long-term raiders out there. These optional, smaller secret ruins work perfectly fine as hidden caves that must be searched for off the beaten path—and there should continue to be optional secret ruins off the beaten path—but there also needs to be more, bigger ruins that Lara is forced to trek through and solve the puzzles of in the next title. Tombs that span the size of entire regions in this game, with mazes and multiple tiers—this is what will elevate Tomb Raider to the next level. However, what's present in Rise of the Tomb Raider is a big improvement over the previous game, with puzzles that don't just involve pulling levers and making it to a door in time. On the contrary, large multistage tombs that require a bit more thinking are much more common here, and underwater swimming is also reintroduced to the series, which is made extra pleasing given that Lara controls smoothly when in the depths. It's actually unfortunate that there isn't more water-based activity involved, because it is rarely a frustrating experience, unlike in past Tomb Raider titles. Survival and combat is still an important focus, with the hunting of animals and scavenging of tools necessary to craft weapons, upgrade them, and unlock new abilities. 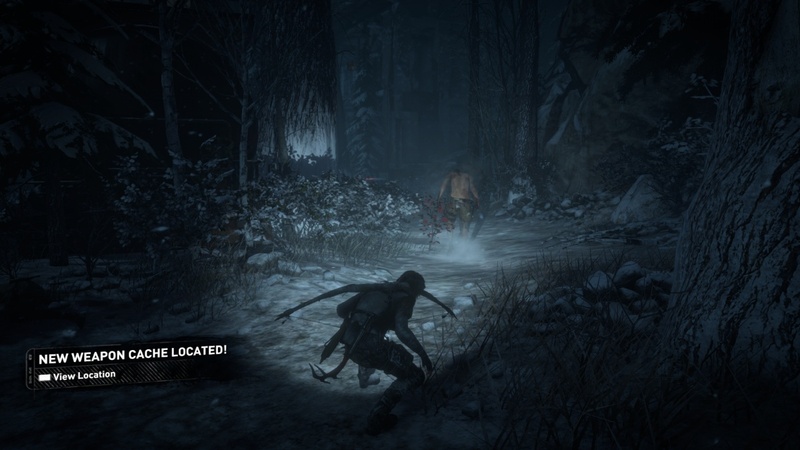 To this end, Lara's box of tricks encompasses improved stealth gameplay, and taking cover in bushes and sneaking along the branches of trees allows for a more diverse and enjoyable range of scenarios to clear out enemies and take down local wildlife. Stealth-killing foes without alerting the entire group of soldiers that are part of this storyline and in search of the same treasure as Lara is always the most desirable result for obvious reasons, but it is usually of even greater significance this time because enemies are extremely quick to charge her down and don't often give a second's breath. Once spotted, the immediate reaction is to either turn around and leg it back to hopefully get far enough away that they lose sight of you, or just go all in and blast the crap out of them. Sometimes, there is very little choice but to go guns blazing, anyway, due to limited places to hide in enclosed areas. Whilst the third-person shooter mechanics handle just fine—and that goes for the platforming side, as well—combat encounters can hold things back a bit, at times. What does add to the atmosphere is the incredible use of audio, the likes of which haven't personally been experienced to such an extent before. Rise of the Tomb Raider uses the Dynamic Percussion System from Intelligent Music Systems, which procedurally generates new music in real time, depending on what is happening on-screen. Whether Lara is sneaking the treetops, pouncing on enemies, choking an unexpected foe from behind, running from a pack of wolves, or cautiously hiding from soldiers on high alert, the music adapts to the situation she is currently in, with the types of orchestration and tempo changing to reflect the action. Since there are no loops or crossfading, the unique application of audio becomes noticeable for its accommodating transitions, upping the tension during moments when suspicious soldiers are seeking Lara out, or giving a feeling of urgency when having alerted a lone soldier that may call for backup. That isn't to mention how natural and well-suited the soundtrack is applied in other areas, such as when solving puzzles or discovering hidden tombs. It's one thing to write a great soundtrack, but this may be the next big thing in the way music is presented in video games of this kind. Dynamic music has been done before in small doses (Ocarina of Time being one of the most famous examples), but Rise of the Tomb Raider has taken it to the next stage—and it is a wonder why it has taken till now to apply it to this effect. For all the excellent work done in creating an immersive experience, though, this expedition does suffer from the same immersion-breaking problem of the previous game, and that is the heavy reliance on Survival Instincts to highlight objects of interest, crafting materials and more. 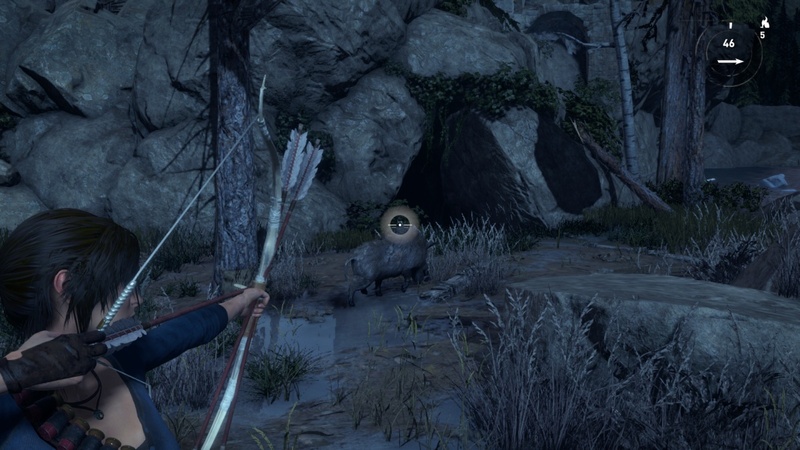 Due to the nature of the game, Lara needs to take every opportunity to pick up items that allow her to upgrade her inventory and abilities, but nary a few feet can pass her by in unexplored areas before the need to click in the right analogue stick comes into play again. Treasures and documents that expand the lore and plot are also hidden (or not-so-hidden) in surrounding regions, and it isn't always easy to find them. It becomes second nature to activate Survival Instincts every few seconds, to the point that it doesn't so much as feel like exploring as it does a game of 'spot the shiny orange objects.' Avoiding using the feature is, of course, an option, but it becomes so necessary and ingrained into a habit that it's almost impossible to refrain from, resulting in being pulled out of the adventure on too many occasions, when the focus should be on… well, adventuring. Multiplayer deathmatches haven't been included this time around, but it has proven to be for the better, as focus has been put on more than serviceable download content that comes on the disc in the PS4 20 Year Celebration edition. New for this release is the major story-related scenario Blood Ties, which sees Lara exploring Croft Manor in search of evidence left by her father that she holds the rights to the estate in order to shut down Uncle Atlas' threats at claiming the mansion for himself (quite why he holds the same name as a key item in the main story is anybody's guess). Although this entails a lot of stopping and starting to read the plentiful documents dotted about the house, Blood Ties goes some way to establish the character of Lara by delving into her past in a more laidback setting devoid of combat, and further helps to set the stage for things to come. There are even some lovely little nods to previous games here, which fans will appreciate, as well as the option to play the mode in VR for those fortunate enough to have splashed out on the PSVR hardware. Following that, the rest of the modes available can be viewed as non-canon, but offer a lot of diversity to satisfy different interests. Lara's Nightmare is the "zombies mode" that throws in an alternative take on Blood Ties, with Lara having to fend off waves of infected and defeat a boss in her own mansion. It's short-lived, but might just about appeal to score attack fans with a penchant for zombie survival. Endurance takes some inspiration from indie game Don't Starve, and sees Lara trying to survive in the procedurally generated Siberian wilderness, hunting and burning wood to keep hunger and body temperature levels up, all while searching for relics in tombs and places around the map. Featuring a day and night cycle, the goal is to survive for as many days and to collect as many treasures as possible, going for high rankings in the leaderboards, but the fact it can drag on for so long makes it a chore to play after a while. However, co-operative play has been added for this release, adding another layer in how to approach the survival mechanics in this mode. Featuring zombies again is Cold Darkness Awakened, whereby a Soviet weapons research facility is reactivated, as the gas transforms a bunch of soldiers into infected humans similar to those in The Last of Us, where they lack sight, but gain advanced hearing, requiring Lara to be as discreet as possible. The aim here is to shut down the facility that is about to unleash a chemical weapon in the vicinity, but needs Lara to deactivate three plants connected to the core. This means listening to teammate Nadia's instructions and working out which switches/levers to hit, else running the risk of being overrun with zombies, and eventually leading to death. There feels like a greater degree of urgency to this mode, and the night time setting (naturally) and Lara's quietened speech only enhances the atmosphere. Things get hectic in the central building, though, and the only deaths may come once this area is reached. Score attacking is part and parcel of all of these modes, and storyline chapters are even given the option to replay them to complete in the fastest time, encouraging challenging friends and the online leaderboards. On top of this, custom missions can be created and played, which basically consists of some item fetching, hostage freeing and enemy killing across multiple stages. With freedom in choosing difficulties and applying handicaps and boosters through unlockable and purchasable cards (with in-game or real money) that affect the score bonuses attainable, there is a little something for everyone outside of the story campaign. These modes only serve to add to the overall package in a positive way, and are worth trying out once the main game is completed, but they are generally only entertaining for the short-term and won't demand coming back to them too many times over unless really invested in shooting for high scores.